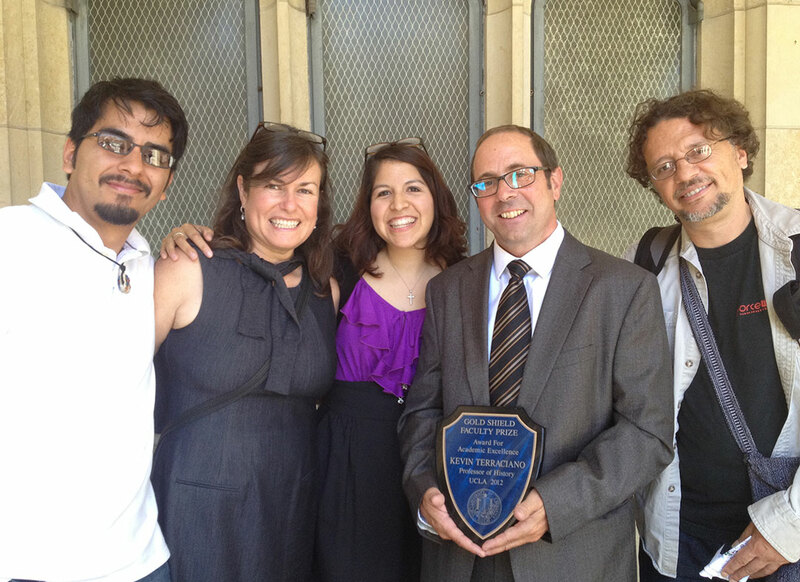 (L-R) Fernando Serrano, Miriam Melton-Villanueva, Verónica Gutiérrez, Prof. Kevin Terraciano holding his 2012 Gold Shield Faculty Prize, and León García Garagarza. 2012: Award for Academic Excellence: UCLA Faculty Gold Shield Prize. 2012: Contributing author to edited book. Tufts Prize from American Society of Hispanic Art Historical Studies (College Art Association) for best book on Iberian and Latin American Art History published in 2011, Contested Visions in the Spanish Colonial World. Chapter titled "Competing Memories of the Conquest of Mexico." 2004: Co-author of research article. Heizer Prize from American Society for Ethnohistory for best research article (co-authored with Lisa Sousa) in field of ethnohistory published in 2003, titled "The 'Original Conquest' of Oaxaca: Late Colonial Nahuatl and Mixtec Accounts of the Spanish Conquest." 2004: Author of book. Cline Prize from Conference on Latin American History (American Historical Association) for best book on history of Indians in Latin America published in 2001 and 2002, titled The Mixtecs of Colonial Oaxaca. 2003: Author of book. Bolton-Johnson Prize, Honorable Mention, from Conference on Latin American History (American Historical Association) for best book in field of Latin American history published in 2001, The Mixtecs of Colonial Oaxaca. 2002 Author of book. Wheeler-Voegelin Award from American Society for Ethnohistory for best book in field of ethnohistory published in 2001, The Mixtecs of Colonial Oaxaca. 2001: Author of research article. Robertson Prize, Honorable Mention, from Conference on Latin American History for best research article in field of Latin American history published in 2000, titled "The Colonial Mixtec Community." 1999: Author of research article. Heizer Prize from American Society for Ethnohistory for best research article in field of ethnohistory published in 1998, titled "Crime and Culture in Colonial Mexico: The Case of the Mixtec Murder Note." 1985 Author of Honors/MA Thesis. Herring Award from Pacific Coast Council of Latin American Studies for best honors/MA thesis in Latin American history in 1985: "Religion and Revolution in Nicaragua." 1985: Author of Honors Thesis. Carey McWilliams Award from UCLA Department of History for best Honors Thesis in 1985: "Religion and Revolution in Nicaragua."